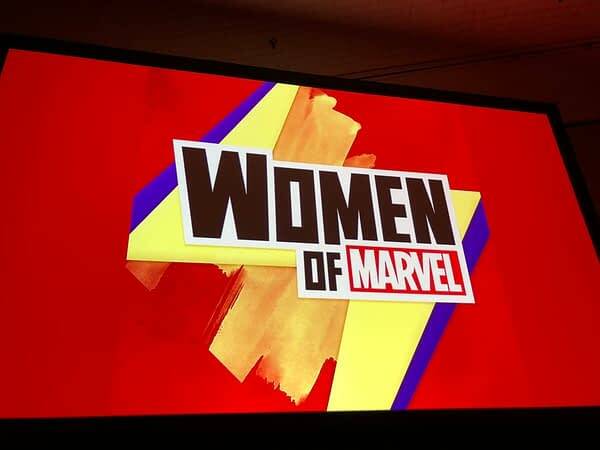 During the “Women of Marvel” panel this afternoon at NYCC, Marvel’s VP of Content and Character Development, Sana Amanat responded to a fan question about the disappearance of certain fan-favorite “diversity” female-led and LGBT comics. We’ve covered Marvel’s habit of dropping diverse book titles early for quite some time. While the “Marvel Cancellation Bloodbath” ostensibly cancelled a number of failing books in 2017, the cancellation fest seemed to disproportionately affect books with female protagonists or LGBT heroes. And the “Women of Marvel” fanbase are exactly the people who would be upset about those mass cancellations. So during the fan Q&A portion of today’s panel, an audience member asked about the decrease in female-led titles over the last year and change. The question was fielded by Amanat as a representative for Marvel’s core staff, who responded by skillfully side-stepping the question. Amanat’s response essentially boiled down to market performance, “sometimes we have more, sometimes we have less, it depends on what is working.” However she did assert that any number “more than one book, which is what we started with nine years ago,” was a good thing for her. Amanat also noted that, for Marvel, “success is not measured by how many monthly books are out there, we also look into trade paperbacks” and other avenues like Marvel Rising, and the company’s various other ventures outside its mainstream comics line.